Hello again you cosmic dancers. Thanks massively to everyone that poked their head in to our launch at Bungalows And Bears in September, we had a blast, and by the looks of it so did all of you! 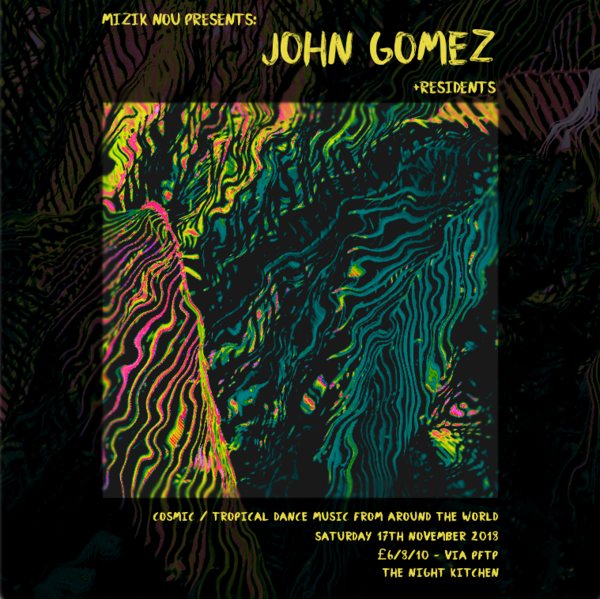 We're keeping things moving toward the cosmos, and next up we're throwing a party at one of our favourite spaces in Sheffield, The Night Kitchen... Where we'll be joined by one of our favourite DJs around: John Gómez! For anyone not familiar with him (first of all ask yourself why, and then get familiar), he's an incredibly eclectic selector with an unbelievable record collection, and a penchant for the tropical/cosmic... So right up our street! His RA mix from earlier this year is probably one of our favourite 100 minutes of music in the universe, and his personally curated compilation 'Outro Tempo' is an enlightening look in to early Brazilian electronica. Besides this he also hosts the Tangent party with Nick The Record, and hosts the Rush Hour show on NTS Radio. In support will be our usual residents Gabe + Dave (AKA Sasquatch - DJ + 1/2 of The Native Project). Tickets priced at £6 earlybird, so get on them quick sharp.